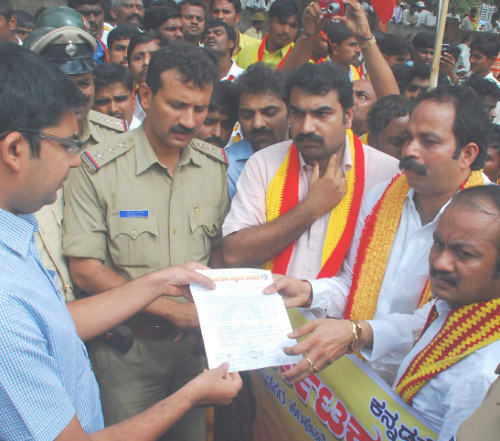 The KRV(Pravin Shetty faction) went in a form of a rally from Ashok Cricle to DC office and later submitted a memorandum to DC in charge AjayNagbhushan. They demanded that strict action must be taken against the Mayor and her deputy and also urged a ban on the MES. The activists alleged that the local elected representatives are trying to save the corporation eying the Marathi vote bank. An effigy of Shiv Sena supremo was also burnt for his remarks on Dr.Kambhar. From there the activists turned towards the corporation but the police arrested them en route. From the past fortnight Belgaum is seeing some unruly scenes, protests and burning of effigies daily by one or the other party. Mr Kambar cannot develop Kannada alone or authoritate with few silly comments or I feel pity for his cheap publicity stunt, this silly comments have given birth to war of words between Bal Thakary and Mr Patil Puttapa, bloody both have not done anything to Belgaum and I challange the commenters in this forum to show me one single instance of maturity…infact now Vaishali hotel (belongs to Shettys of Mangalore) is ran sacked..
Why even the state govet have two yard sticks for Raichur and Belgaum ?????? We all can go on and on and on.. the truth is, only a faction is opposed thats few MES people. Honeslty I tried it myself , at a govt office in a village panchayat, I simply said I don't know kannada and can speak only marathi, they helped me in everything right from translation to filling up a form. So I don't think any villager or senior citizen will have a problem! Moreover, Govt's are making smaller states for better administration and development, also creating new states in no problem, but uniting is.. for all PSC (public service commision) employees have to move out, the entire thing, that is difficult. Where will all the HESCOM, PWD, POLICE, REVENUE, and 10000's many more go? Forget that, Maharashtra itself hasn't able to develop Vidharbha and is short of funds, how will it manage Belgaum? Sholapur is more populated than Belgaum, but belgaum is ton more developed than it! Even Few marathi businessmen don't want that to happen as there is OCTROI is Maharastra. Only one thing to say – "exception cannot be considered as examples or references". Recently you might have read of Traffic constable broke a guys Driving license Card for not speaking in Kannada. Also the gyanpit awardee Mr. kambar "requested Marathi people to go and settle in Maharashtra if they want Marathi. There are such good and bad peoples on both the sides of the front. "exception cannot be considered as examples or references". No, I haven't read it, let me say.. haven't found it (tried searching it alot)… "Where was it "? Which papers, news? No, its not wrong to demand public administration in their own language in a "Democratic" country , but its wrong if one does tries to do it in a an undemocratic way! Accepted, but it has to be done in a legal way (the APEX COURT, Supreme Court), not by bandhs, or vandalism. In a democratic country there is a system called as law, approaching it is the right way and not by provoking people. Right from 1956 to every Prime ministers, Presidents cabinet ministers, National Minority commission, Chief Ministers, High court, Supreme Court every one has been approached. Time to time memorandums have been submitted to these authorities to solve/mediate on this issue. As far as provoking is concerned its the other way round, when Mayor Vijay More constitutionally passed a motion pertaining to Border dispute. In reply what did govt do, it dissolved the corporation. and many more such incidents, most of the time its the state govt and pro-Kannada organizations are provoking the people. I am not against any language. every language and culture should flourish but not by destroying the other. Please don't just write anything with incomplete knowledge. @ vindhuindian "Also please note, as per your reference of those cities & States, the Marathi speaking population have not migrated from MH and settled in Belgaum"
Belgaum: There is historical evidence to show that areas to which Maharashtra has staked claim have been populated by Kannadigas for centuries, and Marathis are recent settlers, according to former Lok Sabha member A.K. Kotrashetty. Speaking to The Hindu in the light of references to the boundary dispute by speakers at the inauguration of the All-India Marathi Sahitya Sammelan on Friday, Mr. Kotrashetty quoted from historical documents and other records and observed that it was only during the Maratha rule that Marathis migrated and settled in Belgaum, Khanapur, Nippani, Karwar and adjoining areas. Records show that areas to the south of the Krishna river were inhabited by Kannadigas, he said. Among these records are the Aithihasik Lekha Sangrahas (ALS); the Peshwa Daftars; documents prepared by historians from Maharashtra; Historical sketches of South India by Col. Mark Wilks, who was Resident of Mysore; the History of Marathas by Capt. Duff, who was Resident in the court of the Satara King; the report of Elphinston, then Governor of Bombay; and letters written by Thomas Munro. It is not know whether boundaries were fixed at the time. The Bombay Government was bound to represent the case of Bombay-Karnataka people before the States Reorganisation Commission (SRC) as a Karnataka government was not in existence to put forth claims to areas inhabited by Kannadigas. Presiding over a Marathi Sahitya Sammelan in Belgaum in 1929, Shivram M. Paranjape analysed the co-relation between linguistic frontiers and political dominance. He pointed out that along with expansion of kingdoms, linguistic frontiers were extended, the English language being the greatest example. "If we consider our own example of Marathi language, the truth of the above maxim becomes evident. Really speaking, Marathi is the language merely of Maharashtra. But today, it is being spoken in Tanjavur, Baroda, Gujarat, Nagpur, Indore, Gwalior, Sagar, and Jhansi." Paranjape said students of linguistics should know that when Dhanaji Jadhav and Santaji Ghopade led their army towards Chandi and Chandavar and imposed their sovereignty in Sandur, Gutti, Tanjore and various other places in the Madras Presidency, they spread their mother tongue. The Peshwa Dafter speaks of invasion of Shahpur and Belgaum. In Main Currents of Marathi History, G.S. Sardesai, noted historian from Maharashtra, refers to the Karnataka boundary as the territory to the south of Krishna. It gives a list of forts and fortresses which were in the possession of Peshwa Bajirao II in 1809-10. When General Munro became Governor of Madras with Bombay-Karnataka under his administration, he recommended that Maratha influence on areas inhabited by Kannadigas be brought down. By 1822, annexation of the region to the Madras Presidency was complete. The area was under the presidency till 1830. In 1826, the Government of Bombay started fresh correspondence with the Madras Government to take back Bombay-Karnataka from the Madras Presidency. Sir Thomas Munro objected to this and wrote to the Bombay Government. Under the Bombay Regulation XXIX of 1827, Solapur, Bijapur and Athani were annexed to Poona district. In 1936, Belgaum district was formed. As per the 1881 Census, 64.39 per cent of the population was "Canarese" and 26.4 per cent Marathi. If you go to Andra or Tamilnadu you will find the administration in telagu or tamil and you can find many kannadigas over there. Have you ever heard asking them this kind of demand? Please answer frankly. Same applies to Mumbai and Bangalore. There are many North Indians settled there. But i never heard asking this kind of demand. We should not expect our native culture if we are staying in other city or state or country. We should get adjust to it or learn what they are following. Please think. I agree with Sandeep, KRV is not a political party like MES. Some body said KRV is formed because of MES. that is right; atleast some one is going against MES which is keeping Border dispute alive. Also In Maharashtra, All Govt transactions are happening in their local language. what's wrong with that? In the same Karantaka is also implementing the Kannada as administrative language in all offices.. I don't want to go on to discuss more on KRV or MES. But as the point is been raised as who gave birth to who. Please note, MES exists only in Belgaum that to from year 1956. Whereas KRV is spread all over the State. I don't think this justify the origin of KRV with relation to MES. Karnataka have border dispute with almost all neighboring states be it Kerala, TN, Andhra or Maharashtra) and KRV is actively involved in all the disputed issues; be it Water sharing dispute, BOrder Dispute or Flim & Flim personality dispute. I was expecting similar responses. My Dear friend for your kind information, the demand put forward is not any privilege demand. Its the constitutional right of the citizen. Please refer to "Article 347" of Constitution of India (347. Special provision relating to language spoken by a section of the population of a State On a demand being made in that behalf the President may, if he is satisfied that a substantial proportion of the population of a State desire the use of any language spoken by them to be recognized throughout that State or any part thereof for such purpose as he may specify CHAPTER III LANGUAGE OF THE SUPREME COURT, HIGH COURTS, ETC….. ) This speaks about linguistic minorities. For your kind information, according to recent census the Marathi speaking population of the district is around 22% and more than 52% in Belgaum Taluka itself. Therefore, the demand is constitutional right. Also the National Commission for minorities acknowledges this. As far as others (Andra, Tamilnadu, Mumbai B'lore) are concerned if people are ignorant towards there Rights, then its there problem. Also to note, I don't think the minority % of people residing in those places qualify to claim this Right. Also please note, as per your reference of those cities & States, the Marathi speaking population have not migrated from MH and settled in Belgaum. The comparison of Belgaum and other disputed location with Mumbai/Bangalore is completely wrong. Please do keep this in mind!!!! I am not concerned what MES/Shivsena or KRV/JaiKarnatak does, I am just keeping my views on behalf the innocent sufferer (mostly the villagers & senior citizens) around the Belgaum. Dont fight the belgaum will go in maharastra were it was first,court will give its decision. Exactly! Sandeep. I agree with you 100%. In the blog pertaining to Belgaum city population census , it was mentioned that there was a decresae in population of Belgaum city.This may get cumulative till apoint where belgaum may loose its Corporation status . The reason is clear the tumor of Belgaum Border dispute. Furthur adding to the bad situation is Hubi & Kolahpur may become giant cities as one gentle man made a comment which is very true. All the said manifestation has already appeared , The Airbus A319 can land in Hubli which they did for some time but later discontinued for administrative reasons. Hubli which did not have a Airport once upon a time has an aiport much bigger than Belgaum. The proposal to make hubli Airport to an international status is another manifestation of belgaum losing importance. Usually the Airport size and number of flights is a measure of the citys commercial and Industrial growth. The future of Belgaum is that ÓNLY GOD KNOWS". Keep aside the MES & KRV and just think – Don't you feel the Marathi Speaking population (as a whole) is this part of state face problem due to compulsion of any particular language? Is it wrong to demand public administration in their own language in a "Democratic" country? I don't understand.. why not MES accepts and go for development (apart from Marathi, thats all they say), why they not fight for roads, water, development, accepted, marathi guys stays here, so why don't you work for the betterment!!!!! Has ever MES fought for DEVELOPMENT, EVER????? Come on Guys! Don't wanna learn a language.. don't, none is forcing, its liberal! 🙂 talk chinese.. none will ask.. Please for God sake.. don't support who can't develop BELGAUM. All MES, KRV are doing it for political gimmick. You know what happened years back 🙂 british ruled by dividing us, same theory here! 🙂 moreover they don't wanna rule, they wanna make money!!!!!!! Instead of Jeeyo aur Jeene Dho….it has become Maaro aur Maarne Dho……..This is taking us back wards…..These kind of Mayors and Dt Mayors should not get elected in the first place…its the fault of the People…by the people …for the people…….